A report ‘N on the Table: The inﬂuence of food choices on nitrogen emissions and the European environment’ has been launched at the European Parliament today (12-1-16), in an event hosted by MEP Sirpa Pietikäinen. Mark Sutton of the Centre for Ecology and Hydrology and Henk Westhoek of the Netherlands Environment Assessment Agency, PBL attended the launch, and a response was given by Janez Potočnik, Co-Chair UNEP International Resource Panel (IRP). During a recent meeting at the European Parliament on revision of the National Emissions Ceilings Directive, MEPs asked what is the relationship between mitigation of methane and ammonia emissions. The attached Policy Brief on Methane and Ammonia Air Pollution has been prepared by the Task Force in response. Overall, measures to reduce these gases go hand-in-hand through links to sector activity. The Task Force (in collaboration with the Centre for Ecology and Hydrology) has recently printed a Russian language version of the updated Guidance Document on Control Techniques for Preventing and Abating Emissions of Ammonia which was adopted by the Executive Body in 2012. Copies were distributed at the 33rd Session of the Executive Body of the Convention in December and 300 copies have also been sent to Russia for further regional distribution. A workshop on the revised UNECE Framework Code on Ammonia Emissions is being held in Edinburgh next month. The workshop is being supported by the European Commission and will provide a chance to discuss the current version of the draft code, before it is presented to the Executive Body of the Convention on Long Range Transboundary Air Pollution for hopeful adoption in December. A draft agenda can be downloaded here. The Task Force (in collaboration with the Centre for Ecology and Hydrology) has recently printed a version of the updated Guidance Document on Control Techniques for Preventing and Abating Emissions of Ammonia which was adopted by the Executive Body in 2012. 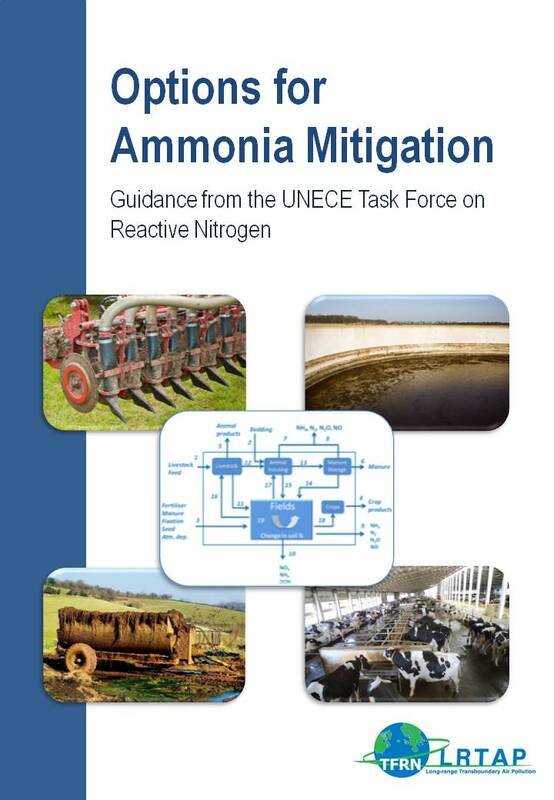 The volume has been titled 'Options for Ammonia Abatement: Guidance from the UNECE Task Force on Reactive Nitrogen'.